Vijay63 is getting bigger by the day. The film is one of the most anticipated films in Tamil and is busy completing its shoot. 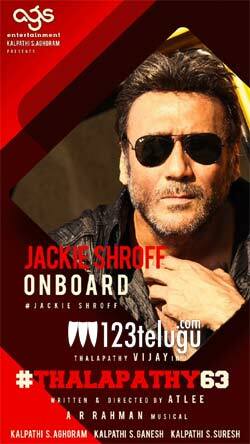 The latest we hear is that noted Bollywood actor, Jackie Shroff has been roped in for a key role in the film. Atlee is directing this film which has Nayantara as the female lead in this as-yet-untitled film. AR Rahman takes charge as the music composer for this film. This yet untitled film will release this Diwali 2019. Watch out this space for more updates on this project.